Around 20 climate change campaigners shut down the UK’s newest gas-fired power station early this morning. The protest started at 2am when they got through a security fence and climbed two smokestacks at EDF’s West Burton plant in Nottinghamshire. Some of them abseiled down inside the chimneys and set up camp inside the flues, stopping the plant’s furnaces from operating. The power station in Nottinghamshire was targeted because it’s one of the first in a new generation of highly polluting gas plants planned for the UK. The Coalition Government recently announced it intends to give the green light to as many as 20 new gas plants – a move that would crash Britain’s carbon targets, contribute to the climate crisis and push up bills. Protestor Ewa Jasiewicz, who is occupying one of the chimneys, said: “It’s pretty scary hanging inside a chimney, but we’ve been rigorously trained and have very skilled climbers. We’ve made a cosy camp with tarpaulins, and we plan to share a hot meal this evening at the same time as our friends on the other chimney. 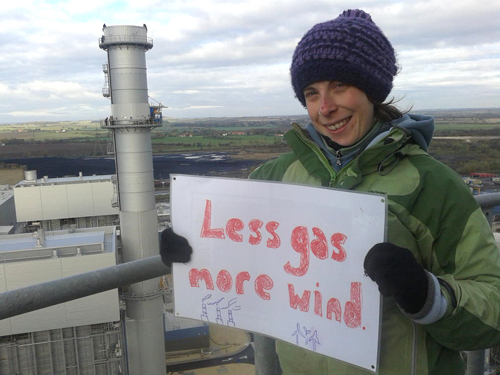 Guardian.co.uk – Why I’m occupying a gas-fired power station chimney.